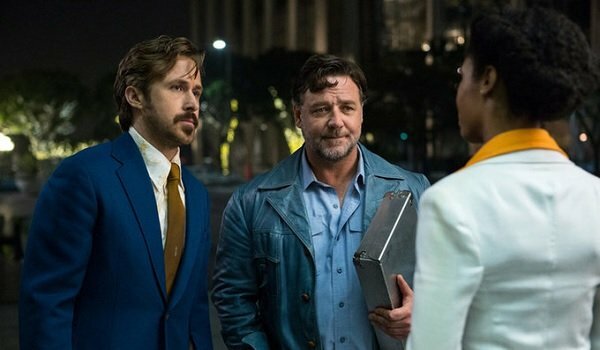 If we haven’t put a fine enough point on our feelings for Shane Black’s The Nice Guys, let us remind you that it’s the comedy that more of you should have seen last weekend. Still, there’s no hard feelings between us and those of you who have chosen to miss out on the funniest movie currently running in theaters. In fact, we want to help convince you go give the film a spin in the next couple of days before X-Men: Apocalypse takes over the box office. With that in mind, we’ve compiled a list of the 10 biggest laughs from the Shane Black detective comedy that not only have us still laughing, but also planning at least one more outing to see it again! Running into the guy that gave you a spiral fracture only a couple of days ago isn’t something that ranks high on our list of preferred experiences. So naturally, Ryan Gosling’s Holland March is more than a bit angry when Russell Crowe’s Jackson Healey shows up to propose a partnership. We don’t know if it was that anger, or just a general sense of clumsiness about the alcoholic detective, but the ensuing problems that March finds himself running into provides one of the best physical comedy moments of this year, if not the past decade or so. It’s also a good reminded of why we outlawed smoking in toilets, besides the whole problem with the smoke and all. In the third act of The Nice Guys, Holland seems to have interpreted a clue and proven his worth as a detective. It’s the sort of last minute twist you’d expect, leading to a huge break in the case that sends everything down the right path. Of course, knowing that Shane Black is behind this detective comedy, the finale isn’t as open and shut as one would think. Sure enough, the moment our heroes arrive at what they think is an apartment block, they find out that the building they’re looking for is now a pile of rubble. With a sheepish grin, and a sudden realization, our detectives revise their thinking and move on to the location they should have moved on to in the first place. While action set-pieces and intriguing detective work are both hallmarks of Shane Black’s finest works, there’s one last component that completes the triangle of trademarks that put a Black film on the map. That piece of the puzzle is snappy dialogue, via one-liners. For instance, there’s a moment where Ryan Gosling’s character ends up losing his cool with a crowd of teenage girls that are attending a birthday party he just happens to be taking his daughter to. So when the birthday girl chastises him for taking the Lord’s name in vain, the response of how it wasn’t in vain, but actually rather useful, is a nice, punchy gag that keeps things on their toes. With any Shane Black detective film, there’s two archetypes that always show up: the smart, detached professional, and the smart-assed dumbass. The Nice Guys is no exception, as Holland March falls so heavily in the latter category that he could make an impression on the sidewalk. Or, in the case of the moment on display, he could punch his fist through a glass window and botch a break-in by getting squeamish at the sight of blood. His overreaction couldn’t be funnier, and it’s a nice prelude to his further injury later in the film – which Holland takes with just as much grace as his relatively minor cuts. A majority of the funniest gags in The Nice Guys come from the misadventures and total ineptitude of Holland March’s approach to pretty much everything. But that doesn’t mean that Russell Crowe’s Jackson Healey is a humorless drudge. As a matter of fact, some of his funniest moments are when he openly opines on the subject of marriage – which happens to be one of Jackson’s pet peeves in life. His most memorable pearl of wisdom when it comes to marital woes? "Marriage is buying a house for someone you hate." Part noir, part sarcasm, all comedy. 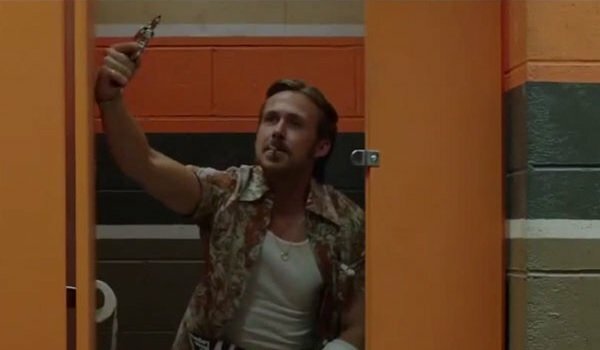 Much like Jackson Healey’s running gag throughout The Nice Guys is his issues with his failed marriage, Ryan Gosling’s Holland March has his own recurring subject of humor. Though depending on who you talk to, Jackson especially, the subject of Adolf Hitler may seem like a redundancy when compared to the hell marriage represents the older, more grizzled detective. But that doesn’t stop Holland from doing everything from breaking out into a random speech in German, to making the suggestion that Hitler was just following orders. Let that last one sink in for a moment, and you’ll see why it made us laugh so hard. Rule #1 of Jackson Healey’s "Rules to Be a Proper Detective," is that one should never drink during a case. This is a rule that Holland March never learned, as exhibited during his behavior at the big Hollywood party he and Jackson are canvassing in their search for the missing Amelia. If his biggest mistake was chasing mermaids underwater, in hopes of interviewing them for clues, we might have been able to write this off as his natural clumsiness. But if you’re pretending to be shot by a model’s finger guns, and don’t have the common sense to prevent yourself from taking a swan dive into the ditch below, you probably should switch to coffee for the rest of the night. The bright side? At least Holland found a clue when all was said and done. 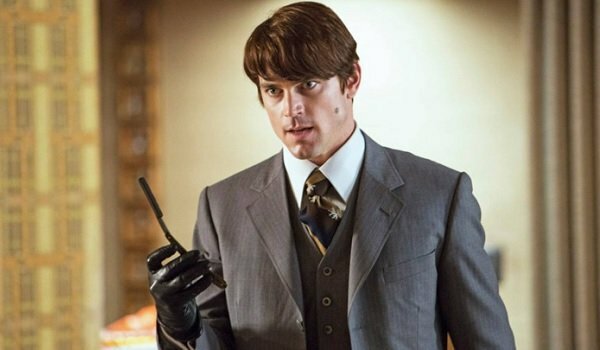 One of the best set-pieces in The Nice Guys was the late in the game shootout between Matt Bomer’s assassin character, John Boy, and our dashing detective heroes in action. If you’ve watched the first Red Band, then you’ve seen the moment where Ryan Gosling accidentally throws his gun out the window of his rental property, which prompts both Russell Crowe and himself to break out into sharp, high pitched profanity. Even after every other effective gag that the movie throws at us before, and after, this moment in the film’s course of events, it’s still one of the most memorable laughs we enjoyed in the theater. 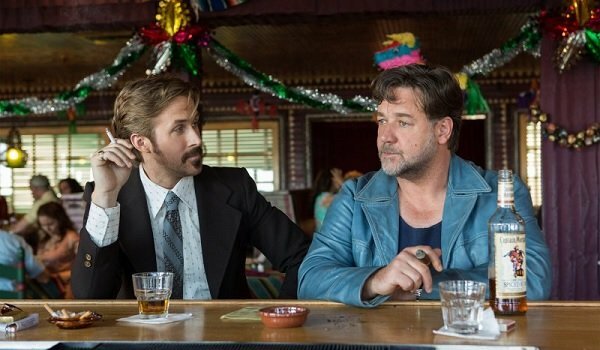 Spoiler alert: The Nice Guys central mystery involves a scandal that crosses between the Department of Justice and the Automotive Industry at large. None of the marketing really portrays that, and the film itself springs said mystery as a sort of surprise in the middle of the film. But by time the film ends, and all is said and done, the auto industry is the subject of discussion during the film’s final bar sequence. Which, of course, means it’s time for Holland March to wax poetic, as only he could. His big prediction about the auto industry is that, "In five years, we’ll all be driving small electric cars from Japan. Mark my words." Of course, any movie worth its salt, and sporting an open-ended conclusion, has some sort of tag that sets up a possible follow up. 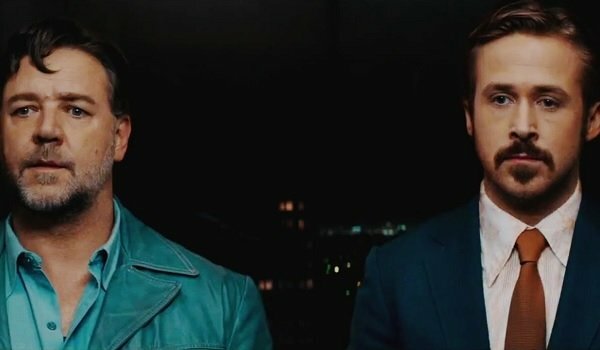 In the case of The Nice Guys, the sequel bait is couched in the fact that Jackson Healey and Holland March are now partnered up as a detective team named after the film’s title. This all culminates in a gag that Shane Black loves to deploy in his more recent scripts: a poor facsimile of someone’s likeness that ends up making them look like they’re from another ethnicity. 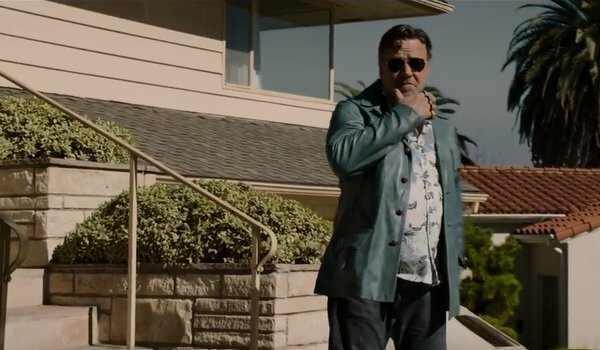 So in the tradition of Kiss Kiss, Bang Bang’s "Native American Joe Pesci" and Iron Man 3’s "Hispanic Scott Baio," we’re proud to tell you that The Nice Guys ends with probably the funniest ethnic misattribution of them all: "Filipino Russell Crowe."